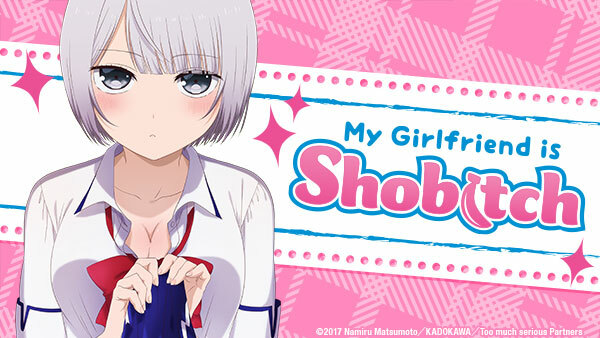 Sign up now to stream My Girlfriend is Shobitch, subs, tons of dubs, OVA's, simulcasts, plus the all new Dubcast℠ editions and more! When Shinozaki visits Kosaka's house, he discovers that Kosaka's attractive mother is just as odd as her daughter. Later, Kosaka furiously studies for their first date. Shinozaki confesses to Kosaka, the girl of his dreams. In return, she offers to learn all the ways of being a good girlfriend for him... ALL the ways. Is she doing too much? E2 | "Just whip it out now!" ...can I say that? It's little sister vs. girlfriend as Kosaka and Kanata "fight" for Shinozaki's attention. Later, Kosaka begs Ariyama for cooking lessons and gets more than she bargained for. A new student arrives, and this sheltered girl partners with Kosaka to study men. When Shinozaki fails to "satisfy" her, the new girl, Rina, explores other options. E5 | It tore... What do I do?! The girls are giving Shinozaki a hard time until they misunderstand a certain question. What hilarious answers will the girls give Shinozaki? E6 | D-don't show this to anyone else, okay? Kosaka has made a new friend, Seiya. Unfortunately for Shinozaki this opens up a lot of new feelings and he can’t quite keep his jealousy in check. Shinozaki and Akiho find a lost dog and are instantly taken with it. Meanwhile, a school camping trip is announced and hilarity ensues. E8 | I-I'm not saying you can take it that far! Igarashi catches Shinozaki in a questionable situation, and to make matters worse she ends up in an embarrassing one! Later on Akiho has her own dilemma to deal with. E9 | I told you, not so suddenly!! Shinozaki is unable to go on a date with Akiho because of some family issues. Shizuku on the other hand, is more than happy to step in! E10 | I can't... take it... any longer! As everyone begins to prepare for exams, Shinozaki reflects on his relationship with Akiho. Will the two be able to convey their honest feelings to one another?